Typhoon Domeng (Peipah) status update April 6, 2014. Domeng will enter Philippine PAR Sunday afternoon and will move west which will hit Eastern Visayas and Mindanao on April 8 Tuesday. Visayas and Mindanao will have a cloudy and rainy skies as Domeng is expected to landfall in Samar and Leyte on Tuesday. Pag-asa personnel said that Domeng will have a higher chance to intensify as it remains in the water until it landfalls. Domeng has 65kph wind near the center and 80kph gustness. Question: How strong typhoon Domeng (Peipah) is? Is Domeng same as supertyphoon Yolanda? 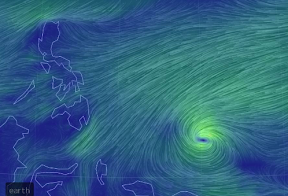 Answer: Domeng has 80kph gustness and 65kph wind near the center (April 7, 2014). Domeng or Peipah is not as strong with Yolanda. It is very weak typhoon compared to Yolanda or Haiyan that had more or less 300kph of gustness.